That’s what Margaret Hamilton has to say about her experience engineering software for NASA at MIT (Massachusetts Institute of Technology) in the 1960s. Back then, software engineering was a relatively obscure profession and regarded by many “as an art and as magic, not a science.” Margaret Hamilton is credited with coining the term “software engineering”–the implementation of programming methodologies used to make a project happen–during her work at MIT and, along with her team, wrote the code for Apollo 11’s on-board flight software. Margaret Hamilton was born in 1936 in Paoli, Indiana and grew up under the intellectual influence of her family heroes: her father, Kenneth Heafield, a philosopher and poet; and her grandfather, a writer, head schoolmaster, and Quaker minister. She studied mathematics and philosophy at Earlham College, and after graduation married James Hamilton and taught high school mathematics for a time. While her husband attended law school, Hamilton started her career at MIT (Massachusetts Institute of Technology) by programming weather-predicting software. In the early 1960s Hamilton learned about MIT’s NASA contract to develop the software for sending man to the moon. She knew it would be the opportunity of a lifetime, so she applied and got a job working on the software engineering team. Fortunately, Hamilton’s recommendations for creating software that could respond to human error were eventually taken seriously. 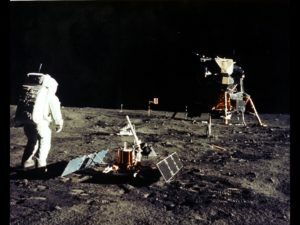 In 1969, during the Apollo 11 mission—the mission to land Neil Armstrong and Buzz Aldrin on the moon—Hamilton’s vision of effective software proved its worth. “Due to an error in the checklist manual, the rendezvous radar switch was placed in the wrong position. This caused it to send erroneous signals to the computer. The result was that the computer was being asked to perform all of its normal functions for landing while receiving an extra load of spurious data which used up 15% of its time. Among other accomplishments, including becoming the CEO of Hamilton Technologies (the company she started after Higher Order Software), Margaret Hamilton received NASA’s Exceptional Space Act Award in 2003 and, in 2016, President Obama awarded her the Presidential Medal of Honor.